Download TorGuard Client and install it. Once installed, you will see Tunnel Type, Protocol, Port / Auth and Cipher are set to give you a good balance between security and performance. You can change these values as needed but bear in mind perfromance can be affected when you select higher levels of encryption, you may want to change UDP to TCP as UDP is often filtered on some networks, this normally causes a "Wait" status. Now click "Select Server..." and choose your desired location. For speed, try to select the closest location to you, if the closest isn't the best try work your way out to see what works best for you - also try between Tunnel Types, Ciphers and Protocols: TCP/UDP to see if those make any difference. Click Connect - it will then prompt you for your VPN service username and password and make sure to check "Remember Credentials" so you don't need to keep typing those in. If you haven’t yet changed them they will be the same as your website login details - IF you have changed them through the manage credentials page then they will be whatever you changed them to and separate to your website login credentials. It should then try connect you to the VPN - once you see a "Connected" status it should then read directly below it "Verified" this means you are 100% connected and secured. To Disconnect just hit the Disconnect button at the bottom of the "Connected" window. Download the latest TorGuard Client, double click the image to bring up the installer. Click the dash home icon in the top left of the screen and search for TorGuard. Click the TorGuard VPN client option. 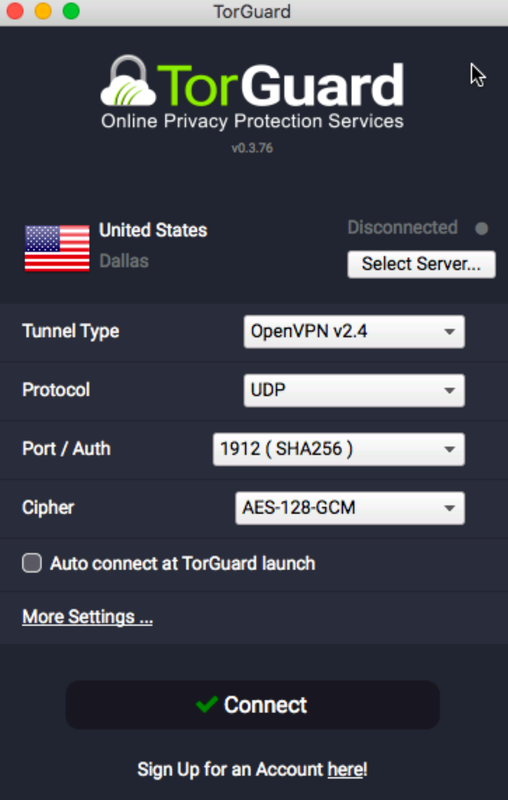 This launches the TorGuard VPN Client, you may need to enter your OS account password again. First, on your Android device navigate to Google Play and search for TorGuard. Select the Install button. Open your applications menu and tap the newly installed TorGuard icon. Select the VPN server that you wish to connect to by tapping the country name and then tap connect. If you need access to the local LAN when connected to VPN please tap the top right hand corner menu and then settings, here you would check the "LAN bypass" option. On occasion you may be on a Wifi hotspot, work network or restrictive mobile ISP that are sometimes likely to block access to our hostnames, to prevent this please tap the mnu on top right hand corner and then settings, tap "Server IP Lookup" and check "Use Direct IP". First, visit the App Store and download the TorGuard iOS VPN app. After install select the location you would like to connect to then tap "Connect". You will be asked to approve our VPN server settings on connection to our server, select "Allow" to proceed to install our VPN confguration, this will happen each time you switch the VPN protocol. Enter your TorGuard VPN username and password when prompted and tap "Log in", if you are unsure of these you can change them here. The app should now show a connected status - if for some it does not connect try switching protocols under settings on the top right hand corner. 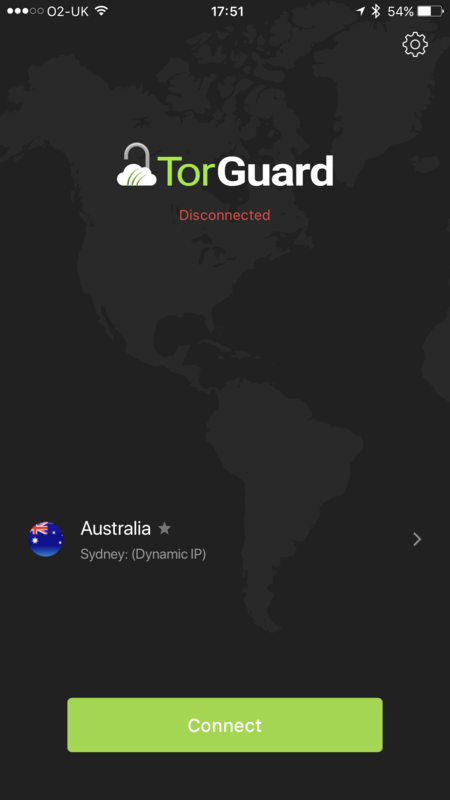 Browse to https://torguard.net/whats-my-ip.php and make sure your IP has now changed. It's important to know that a browser extension will only protect traffic contained within your browser - it will not protect other software or your operating system. Make sure your using Chrome and visit the following URL: Chrome Extension click "Add to Chrome" to install the extension. Once installed, you will see the TorGuard icon on the top right hand corner of your address bar - click it to produce the extensions interface and enter your credentials - then hit Save. Now click the "Country" menu and choose your desired location - you can also select your type or port based on your needs, whatever works best for you. For speed, try to select the closest location to you, if the closest isn't the best try work your way out to see what works best for you - also try between SSL (Encrypted) HTTP (Not Encrypted) to see what works best for you, SSL may work on networks where HTTP doesn't and likewise but both should be fast. 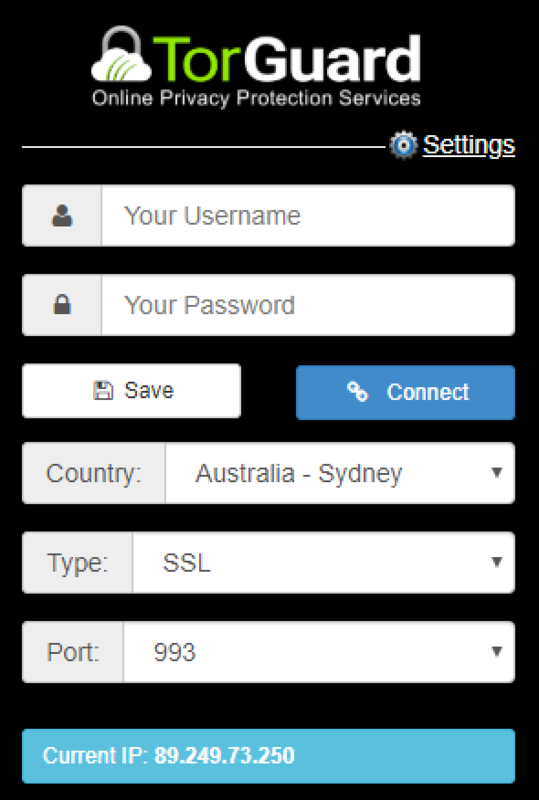 Click Connect - once connected "Connect" will change to "Disconnect" and your proxy IP will show at the bottom next to Current IP: - you can browse here to verify your IP has indeed changed. To Disconnect just hit the Disconnect button. Make sure your using Firefox and visit the following URL: Firefox Extension click "Add to Firefox" to install the extension.